A complete storyboard is not only made of drawing panels, but also includes valuable written directions and information, such as action notes, dialogue, and more. In Storyboard Pro, the editing of these text fields, called captions, is as easy as a drag and drop. You can also reorder, rearrange and modify panels and scenes very easily, without having to go back to the photocopy machine, scissors, and tape! If your script is in .txt or .rtf file format, you can import it into the Script caption field. Select your .txt or .rtf file and click Open. (Optional) Switch to the Vertical workspace by selecting Windows > Workspace > Workspace > Vertical. In the Storyboard view, click the Storyboard tab to switch to this view. If the Storyboard view is not displayed in your workspace, select Windows > Storyboard. In the Script caption field, select the text you want to move. Note that the text will be copied when dragged. NOTE: You can drag and drop text from any caption field to another; it does not necessarily have to be from the Script caption. 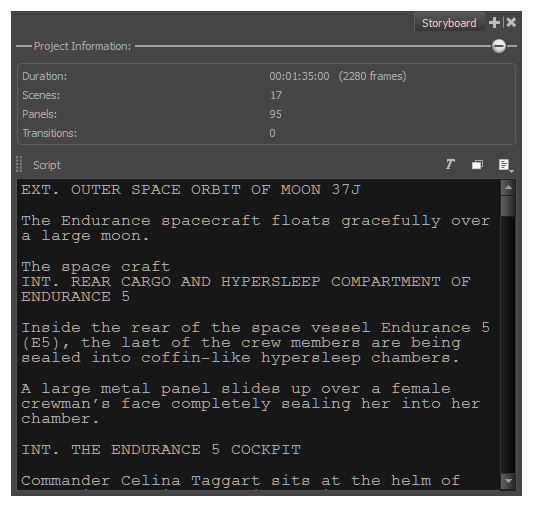 In the Script caption, drag the selected text and drop it in the destination caption of your panel. If you were using the Vertical workspace, select Windows > Restore Default Workspace.